Grams Performance Intake Manifold VOLKSWAGEN - Pann Auto Performance - San Diego largest aftermarket automotive performance parts - What do you drive? 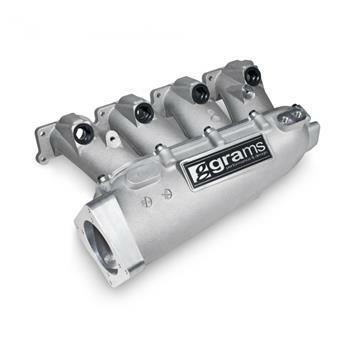 Grams Performance Intake Manifolds are designed to be a direct bolt-in replacement for the stock intake manifold, and features a modular design, with a rotatable plenum that allows for driver side or passenger side throttle body locations. Featuring a larger plenum, the Grams Performance & Design High Flow Intake Manifold was engineered not only for high-horsepower, big turbo builds, but also to offer noticeable improvements in low-end and mid-range power, even on stock turbo configurations. Complete with Vacuum Provisions – No Extra Vacuum Manifold Needed!